Description: Epilith or rarely epiphyte or terrestrial; stems erect to spreading, succulent, thickest at the base and tapering markedly towards apex, rooting only at base, 5–30 cm long, 1.1–2.2 mm diam., with 3–6 leaves at apex; roots smooth, creeping. Leaves spreading to erect, narrow-elliptic to narrow-obovate, 3–10 cm long, 10–20 mm wide, conduplicate, thin, smooth. Inflorescences 7–15 cm long, 2–15-flowered. 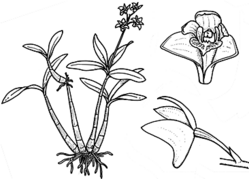 Sepals and lateral petals white to deep purple but usually pink; dorsal sepal 9–16 mm long, 4–7 mm wide; labellum with a green keel and usually boldly marked with purple, 8–15 mm long, 7–12 mm wide. Column c. 3 mm long; column foot 5–8 mm long. Distribution and occurrence: Grows on rocks or occasionally on soil and very rarely on trees in open forest to woodland and in exposed situations from near sea level to c. 1000 m alt. ; north from the Hunter R.
Sporadically hybridizes with D. speciosum (producing D. X kestevenii Rupp).